A "slide" made of a membrane is an excellent suit for hidden observation from a specially prepared or improvised hideout. In it, you can even lie down on wet ground or foliage, without risking to soak clothes and quickly freeze. 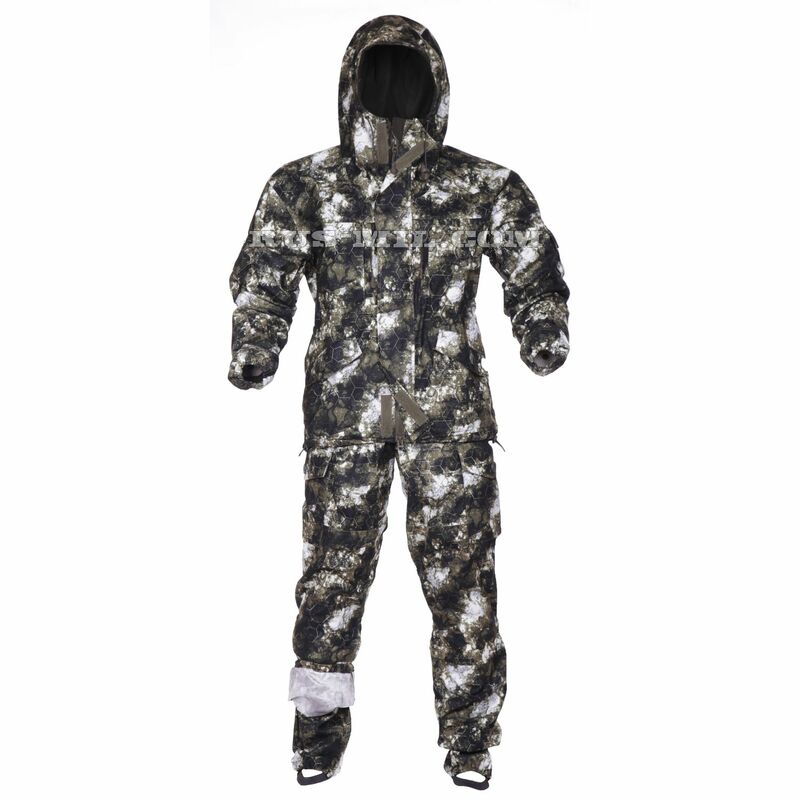 The top of the suit is made of high-quality membrane camouflage fabric Alova (Alova), which is a knitted fabric made of 100% polyester with a waterproof coating applied on the underside. The fabric has excellent strength properties, does not rustle when creased, does not crumple, perfectly holds the color, is not afraid of cleaning. Alova, from which the "Gorka" suit is sewn, excellently protects from the wind, which is very important when it comes to windproof clothing. As a heater in a suit fleece is used. Lining of it is available both at a jacket, and trousers. This material is comfortable in all respects. It is warm, soft, pleasant to the touch, so the suit can be worn directly on the body. In addition, fleece perfectly absorbs excess moisture and perfectly dries. The jacket "Gorka" has a hood that can be adjusted both in volume and depth with the help of two pulling elastic cords with plastic stoppers. Correctly fitted hood will not be thrown from the head, neither the wind nor the lashed branch of the tree. This "hill", no doubt, will appeal to lovers of outdoor activities already because it has many pockets. There are a pair of scuttles on the sides – with valves buttoned, there is a pair on the chest – with access crosswise. They are fastened with a zipper. The pockets of the pockets are arranged vertically and hidden behind special folds of the fabric, so that the flow of water inside through the zipper is eliminated. Two more pockets are on the sleeves. They are overhead, the valves are fixed to the contact tape Velcro. Well and at last it is necessary to not forget to mention one internal pocket with a fastener on a sticky tape. The jacket has a central zipper closure. It is hidden behind a special windproof bar from the outside, and from inside a metal of lightning is hidden behind the fold of fabric, so that contact with the skin is excluded. On the sleeves are rubber bands, which ensure a tight fit of the cuff. The jacket is conveniently fitted with pulling elastic cords at the waist and at the bottom. Pants at "Gorki" are very functional, equipped with removable suspenders. They have a free cut, which will be appreciated by people with a non-standard figure and citizens who are used to living in active movement. The pants also have 6 pockets. The top two – undercut, two hip overhead with a flap on the button, and two hindquarters. At the bottom of the pants are anthers, which will perfectly protect from getting under the trousers and in the burs of debris, insects and water. The trouser leg is fixed on the foot with a loop made of strong textile tape. 2 hip lateral "Cargo" type with a button closure sewn through the tape. The pocket valve is protected against falling objects.